I’m always on the go and usually find it very hard to sit still for a long period of time. This is why having products that are quick yet efficient to use makes my life a lot easier. Have you ever been trying to get ready quick and then you smudge your freshly painted nail? You either try to fix that one nail and no matter what you do it ends up looking terrible or you have to spend another 10 minutes taking the polish off. Only to leave you 20 minutes behind schedule and back where you started! I can’t count how many times that has happened to me. This is why the products below are some of my current favourites. They save me time while actually doing what they’re supposed to do. I had the opportunity to try out this collection at an event recently and fell in love. Not only are the colours beautiful but the polish dried quick leaving me with perfect nails. The colour also lasted longer on my nails compared to other brands. I had barely any chips for about a week. That might not sound long, but to me, it is, as usually within a day my nails are already looking terrible. Being on the go sometimes means having to multi-task. This dual action creme helps to remove tangles from your hair without leaving it feeling heavy or greasy. Simply add a dime to quarter size amount (depending on your hair type) to damp hair. Then run a comb through your hair and style as usual. If you have thick hair and tend to spend a lot of time combing out tangles after a show then this product is for you. Heading into the summer, this product might be more useful than you think. No need to worry about re-applying deodorant throughout the day as Secret’s Clinical Strength has passed the #StressTest. I’ve been using the product for a few years and as mention find it super beneficial during the warmer months. The worst feeling is stepping out the door only to realize you didn’t re-apply for leaving the house. This little guy will keep you odour free for up to 48 hours! 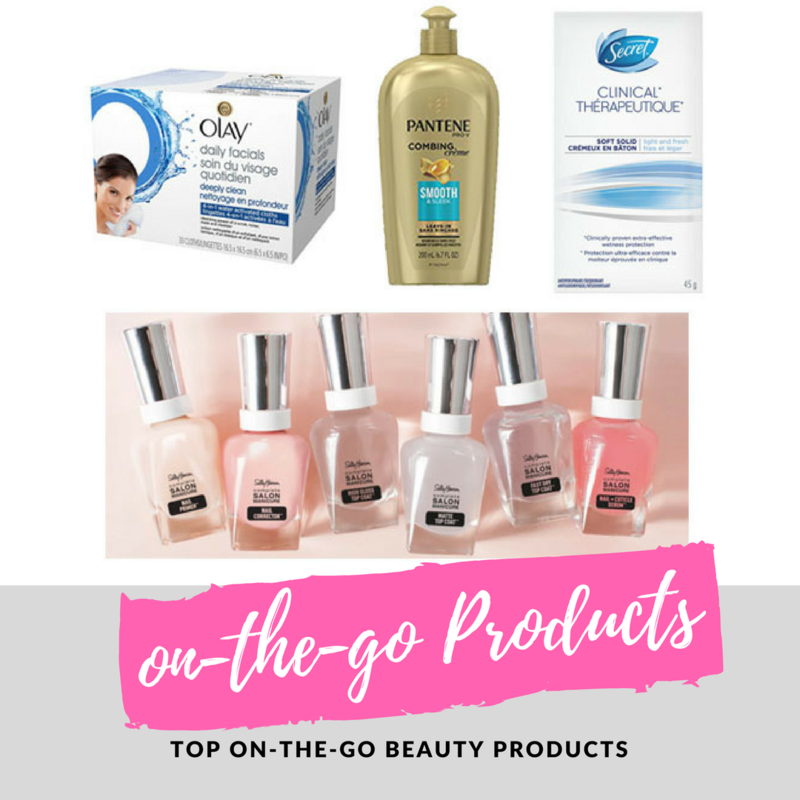 One of my most favourite on the go products is facial wipes! With just one wipe, these multi-tasking cloths help you replace the use of a liquid cleanser, toner, mask or scrub. All you need to do is wet the cloth, lather and you’re good to go. They are perfect for busy people as it will save you time from having to do every step of a night-time skin routine. They are also perfect for travellers as there is no possible way of the product getting all over your clothes as it’s not a liquid. Secondly, you only have to pack the one product, saving you room in your suitcase!